When we first started generating business online for law firms we always had a hurdle to overcome – the doubt and scepticism of lawyers. I would like to say that as the Internet has become a fundamental tool in the day to day life of the legal professional this hurdle has disappeared, but I’d be lying. Despite using the Internet to find and buy all types of products and services sometimes lawyers, for some bizarre reason, think that this same type of buyer behaviour does not apply to them. In fact the opposite is true. Often the purchase of legal services is a distress purchase – people need help NOW! As such they are ready to convert if the site looks and works as they would expect and their enquiry is dealt with quickly and professionally. Below is the new business whiteboard from the office of one of our clients – there is no reason why your own version of this couldn’t look the same. The enquiries detailed in the source column have been initially screened and are, in the words of our client, ‘hot leads’. 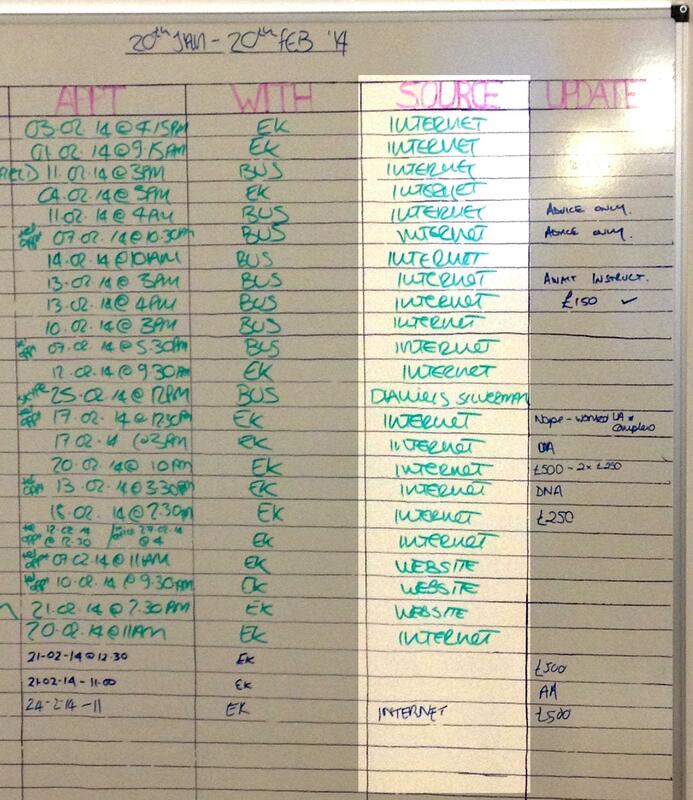 And this doesn’t include the 10 or so which our client’s assistant didn’t have time to add to the board! If you offer retail type services (family law, employment law, personal injury, estate planning etc) then the opportunities for you online are myriad. Certain elements, such as personal injury, are more competitive online but others aren’t particularly and by covering every base service wise you have a good chance of generating business online. The other upside is that average fees are higher and businesses can have frequent legal needs. Advertising on Google for family, employment and in particular business orientated legal services is, for the time being, pretty cheap. Some of our customers operating in these areas can gain 1000 visits from a £300 spend on adwords per month. If this traffic alone generates 100 enquiries which the law firm converts at rate of 30% then this can easily result in a £15k per month return, assuming a new client average spend of £500. The message here is throw as much mud at the wall as possible. Think about the services which are most profitable for you and ensure that they are detailed on your site. Even if you get only one instruction per year, if that instruction is worth £10k for you then it is surely worth 500 words of service content? If the service isn’t included on your site then you definitely won’t generate business online for it. Can they get in touch with you with no difficulty at all? Is there a phone number and online enquiry form on every page? 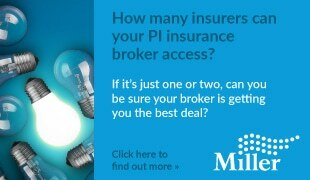 Have you any independent accreditation? If so, it visible on your site? Have you any testimonials? If so, are they on your site. 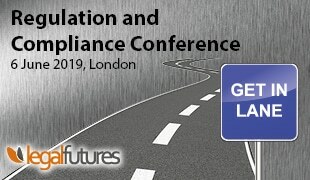 Agencies with names like Blue Banana, Yellow Orangutan or Spaceship are, in our experience, not right for the majority of law firms. They may come up with pretty pictures, grand brand ideas and plenty of pizazz but this exercise is purely and simply about money. There’s no point in having a great looking online presence which nobody sees. Even if it does attract some traffic you need to make sure that the visitor does what you want them to do – either call or fill out an online enquiry form. Obviously it’s good if you can get both but don’t let vanity get in the way of results. Client feedback would suggest that we are managing to deliver on both aesthetics and the bottom line. SEO – Your online marketing efforts should be prevalent in as many online arenas as possible but the most important, by some way, is Google. Search engine optimisation is critical but it needs to be done in a long term, sustainable way by a reputable agency. See this example for what can happen when things go wrong as they did for Irwin Mitchell…You may also be interested in this Penguin and Panda post. At this point you may wish to get in touch with us? Tel 0845 620 5664 and ask for Chris. What is a good Return on Investment (ROI) for you? Is it 3 x spend, 4 x spend or 5 x spend? Work this out and plan for it. 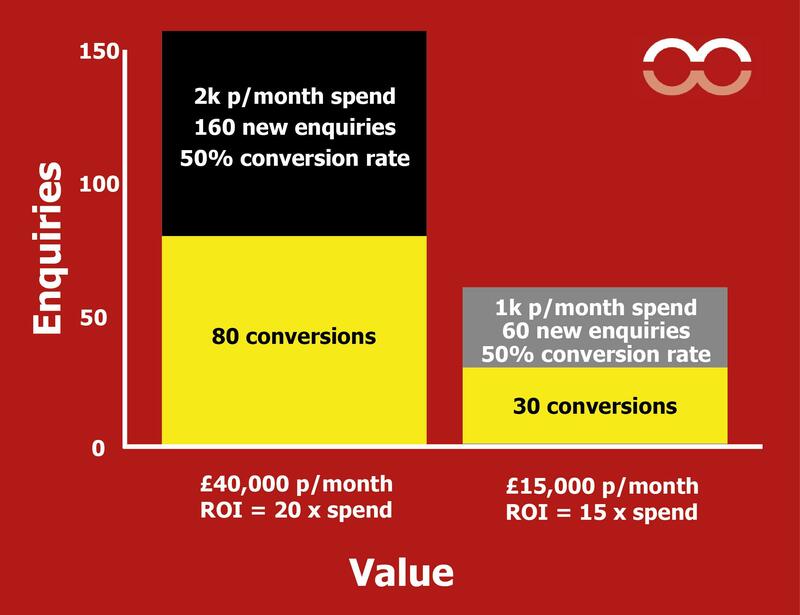 The customers who spend around £2k per month with us get proportionally more from their online marketing efforts than those who spend under £1k per month. Telephones not answered during lunch? Forget it. Receptionist doing a number of other things and letting the phone ring to voice mail? You’ve lost it. Voicemail used to fend off phone calls? Are you mad? There is absolutely no point in getting your online marketing efforts motoring if your internal conversion procedures are on pedal power. 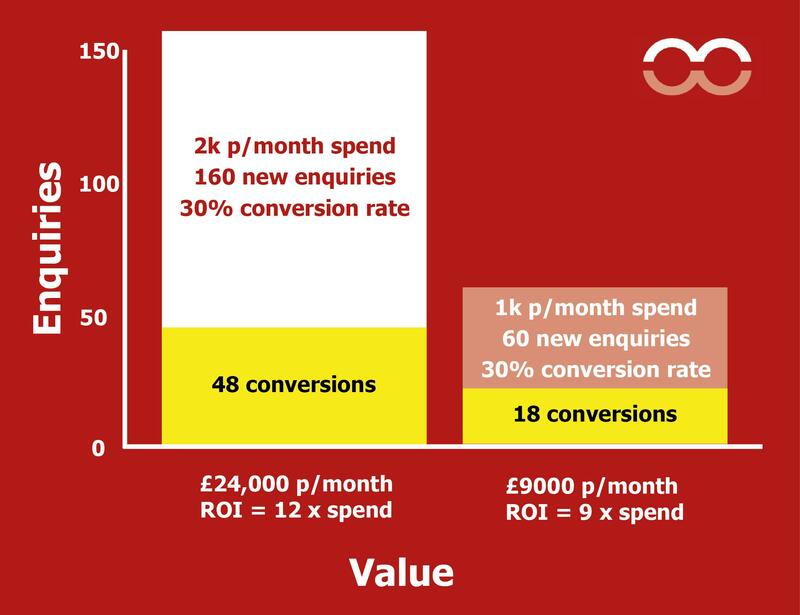 If we revisit the above, but with a 50% conversion rate, this is how the ROI begins to look. At this point I should be politically correct and say something like if you want to do well choose an agency you can trust blah blah blah. Instead I’m just going to say that if you want to make serious money from your online marketing efforts contact us on 0845 620 5664 or fill out the form on the top right hand side of the page.